Keywords added to the project. As you hover the cursor over page elements, you can see tips and descriptions for each function. Click on the project name to get more details on this project. In order to find the necessary project, enter the website URL in the field Project filter. 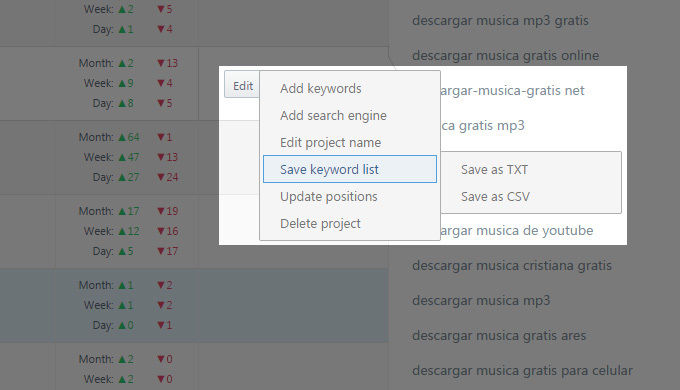 Add keywords – the button allows to add keywords to the selected project. Add search engine – the button allows to add new search engines to the selected project. Edit project name - the button allows to edit the project name. Save keyword list – the button allows to save keywords to .txt and .csv formats. 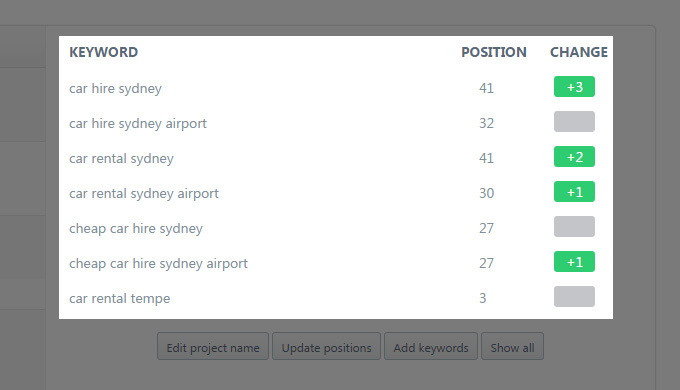 Update positions - the button allows to update positions for the selected project. Delete project – the button allows to delete the selected project. Position changes block shows the information about keyword positions changes in the selected project. Show positions – the button allows to view keywords and their positions for the current day. Show all - the button allows to view keywords and their positions for the entire time. Update all positions now – the button allows to update positions for all the projects created in the account. Add new project – the button allows to add a new project to the user account. How can I quickly find the necessary project from my list? If you need to quickly find the necessary project, use the Project filter field. How can I add keywords to the project? Move the cursor next to the required project and click Edit. Select Add keywords from the drop-down menu. Enter the required keywords to the project and click Add. 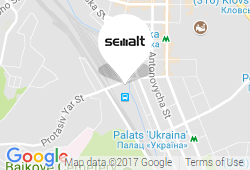 How can I add a new search engine to the project? Move the cursor next to the necessary project and click Edit. Select Add Search Engine from the drop-down menu. Choose the required search engines for your project from the offered check box and click Add. How can I change the project name? Move the cursor next to the necessary project and click Edit. Select Edit project name from the drop-down menu. Change the project name the click OK.
How can I save the list of keywords added to the project? Move the cursor next to the necessary project, click Edit. Select Save keyword list from the drop-down menu and choose one of two offered formats (.txt; .csv). How can I update positions for the selected project? Move the cursor next to the necessary project and click Edit. Select Update positions from the drop-down menu. How can I remove the project? Move the cursor next to the necessary project and click Edit. Select Delete project from the drop-down menu. Click Yes to confirm your decision. How can I check positions in my account? Move the cursor next to the necessary project and click the button Show positions.